Global Teq Training Academy: Project Manager – What does he do? We are often asked this question about what a Project Manager does all day - Since the role is so wide-ranging. Our take on the role of a Project Manager. Here’s what Project Managers do all day. Often, it wasn’t this way. Not long ago, Project Managers were expected to pick up a full-fledged idea, probably a full business case and turn that into a project plan that could be executed. 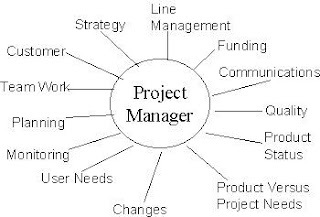 Now, the role of the Project Manager has evolved somewhat and you are likely to find yourself getting involved much earlier in the project, even before it becomes a ‘”Project”. You’ll work with the project sponsor to develop an idea and form an initial picture of the project and work out if it’s feasible. The next step will be to put-together a team who can work on turning that idea into reality, provided your BIG idea is considered feasible. You would require a set of people who can fulfil various roles on a project team. Preferably you will look for (SME’s) subject matter experts in each functional area. However, you will need to take availability into consideration as well. Project Managers cannot always get the staff they want on a team because those experts may be busy on other current projects. If you cannot afford to wait for them to become available, you will have no choice but to work with the people who are available. Having said that, you will not need everyone involved in the team all-the-time. Certain functional experts, such as lawyers or press officers will only need to join the team at relevant stages along the path. Part of the skill of Project Management and Resource Management is to ensure that you let them know their tasks are coming up and then bringing them up to speed on the project as soon as their expertise is needed. During the project initiation and the initial start-up stages, you will work with your team to define exactly what is required to be done. This involves setting-up a clear direction/definition for the work and making sure that everyone in the team understands the objectives of the project in hand. It’s worth phrasing all this in terms of business value/benefits. In other words, explain why you are embarking on this new piece of work. Now that you’ve put your team together, you are all aware of what you have to achieve as a TEAM. This is the job of the Project Manager to ensure that the entire team works together to achieve that goal successfully. It’s a lot tougher than it sounds. Leading a team successfully means, you will have to negotiate the challenges of disagreements, conflict and being on top of communication at all times. Even when the times are tough, you have to motivate your team to do a great job. This involves coaching, training, mentoring and developing the people who work on the project among other things, it does not matter if they are directly working for you or not. That’s an overhead that is often forgotten on projects. However, try to remember that people perform better if they are respected and encouraged to do their best work. Make your project a GREAT place, where people grow and develop new skills. It is then, that people will want to work with you. Leading a team also involves setting up and managing collaboration within. This can be achieved through online Project Management tools or face-to-face team meetings. Collaboration and building a sense of “The TEAM” will help your project resources to cope-up when there is conflict or difficult times on the project, such as a deadline that is suddenly brought forward. • Developing estimates that cover all the project tasks and resources needed. • Working closely with your SME’s (subject matter experts) to make sure that these are comprehensive and complete. • Using the estimate to create a project budget. • Using your budget to explain the project sponsor and being clear about how much the project is going to cost. By doing the above you can manage your costs through accurate cost control until project completion. This involves comparing what you are spending in real life to the estimates and the project budget that you put together. Hopefully they aren’t too far apart, but if you notice a trend towards spending too much or incorrect estimates then you’ll be early enough to correct it. You can fix what you notice, so good cost control is important. NOTE: Good cost control involves more than just tracking what you spend. You also have to monitor the amount of work being done on the project. It’s purely a combination of money and tasks completed that gives you a view of whether the project is spending beyond its means. The one thing you will need to get straight - while the project sponsor is there for the BIG decisions, as the Project Manager you are responsible for majority of the decisions made on the project, even the big ones. As a matter of fact, even when you aren’t actually taking a decision, you will be putting forward a recommendation as to what decision you think the sponsor should take, because you have all the details and have spent ages considering it and they might not have the ability to do that. Not long ago, the project management literature talked about ‘stakeholder management’. Today it’s recognized that you can’t ‘manage’ a stakeholder. It’s naïve and a bit insulting to suggest that, so we talk about ‘engaging’ them instead. In practical terms, the tools involved haven’t changed – it’s just the rhetoric and the attitude that’s different. You’ll still plot out who the stakeholders are on the project and whether they are particularly powerful or influential in relation to the work you are doing. Develop a communications plan and put it into practice. Stakeholder engagement means working with the people who are affected by the project to ensure that they understand the changes that are coming. You’ll do this with the involvement of your team, and it’s what all the work so far has been leading up to. Being able to deliver effectively on what you promised relies on being very clear about what that should be. You’ll need to document key success factors and the measures that will be used to assess whether you achieved what you set out to do. This should be set out in the project’s business case or project initiation document (or both, to varying levels of detail). Therefore it should be relatively straightforward to see what those objectives are – it’s less straightforward to make sure that you are delivering them. Good planning, strong leadership and an ability to see the big picture as well as the detail will help immensely. Delivering the project’s objectives isn’t the end of your role as a Project Manager. The most important thing at the end of the execution phase is to make sure that you provide a clear and complete handover to the team who are going to be managing the project going forward. A good handover means that you can take a step back. You’ll no longer be the ‘go to’ person about the project and you’ll be able to move on to your next project knowing that the business team are able to make the best of what you’ve delivered to them. “Lessons learned” is how we describe what was learned through the project that could be used on other initiatives in the future. The Project Manager should hold a lessons learned meeting at the end of the project. This helps the team grow and maintains organizational knowledge. In other words, it helps the company from making the same mistakes again. So that’s what a project manager does all day. Your actual To Do list might look a bit different from this list, but essentially all the tasks on there will contribute to these elements of being a Project Manager. It’s a wide-ranging and challenging job but it’s also varied and a great career choice!